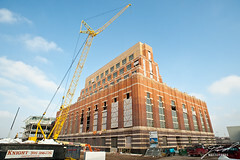 Lawrence of Berkley stopped by downtown Lansing Sunday afternoon to check out the progress on the refurbishment of the Ottawa Power Station as it is converted to the new headquarters for Accident Fund Insurance Company of America. Work was still progressing on a Sunday with crew on the roof and the grounds. I borrowed Larry's 20mm lens having left my 14-24mm back at the car to grab these shots.